Hello and welcome to the 69th installment of the SWD. SAA launched new attack against rebels on Tamurah and Zahraa fronts, however, rebels were able to repel it even tough a huge number of Russian and Syrian airstrikes targeted the area. According to pro-rebel sources more than a dozen of SAA troops were killed during the failed attack, 24 on Zahraa and 19 on Tamurah front, take these numbers with a grain of salt as there is no footage so far to prove even half of the claimed casualties. On Zahraa front in west Aleppo Hayaat Tahrir al-Sham targeted SAA‘s T-72 tank with an ATGM damaging the tank. SDF completely secured Alexandria (Iskandariyah) and Ayed Saghir areas from IS east and west of Tabqa, respectively. New reports from Tabqa suggest that infighting started between IS fighters as part of the fighters wanted to surrender to SDF forces but their commanders refused. Number of IS fighters were killed for trying to flee by their fellow fighters. SDF fully captured Al-Hazimah and Tishreen villages north of Raqqa, but seeing the lack of reports about IS pocket being created it appears that SDF forces from two axis haven’t linked up yet. It was a very eventful day in Hama governorate today which means a lot of misinformation was spread by both sides. North and northwest of Tayyibat al-Imam SAA captured Khirbet Saman, Madajin checkpoint and Tell Muntar. North of Khattab SAA captured Tell al-Nasiriyah and Kufayr Taybat. 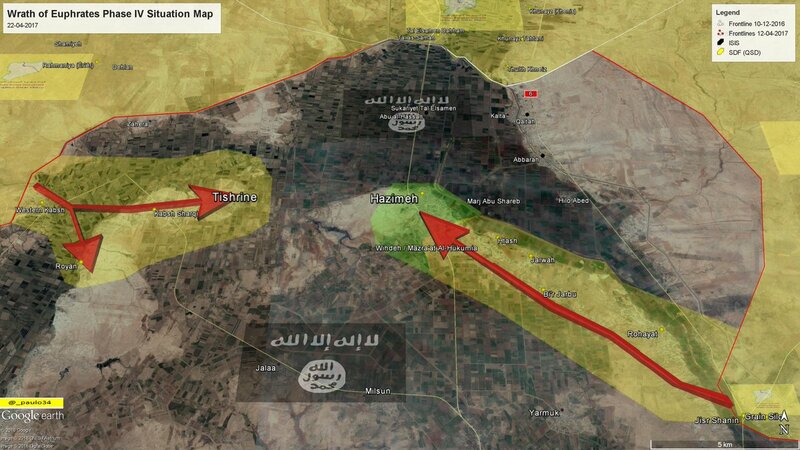 Advances mainly concentrated on securing captured localities and creeping towards Halfaya. SAA‘s advances south of Morek; Al-Bashir driving school, Tell Syriatel and Gharbal checkpoints have been reversed by rebels as well as Sensehr village south of Btaysh. However pro-government sources claimed that SAA didn’t lose any checkpoints captured today so we will just have to wait and see what is the truth. Today’s SAA advances come at a price and how high that price is, rebels launched over a dozen of TOW missiles targeting mostly SAA tanks but other things as well. Just around Tayyibat al-Imam Jaysh al-Izzah launched five ATGM (four TOW and one Fagot) missiles destroying a T-72 tank, two Kornet launchers, three technicals and targeted a group of SAA soldiers. Around Tayyibat al-Imam rebels launched four more TOW missiles, one by Free Syrian Army’s Al-Firqa al-Wusta (Central Division) destroyed a T-72 tank around Buwaydah. Other three TOW missiles were launched by Jaysh Idlib al-Hurr (Free Idlib Army) which reportedly destroyed a Grad launcher and launched two missiles towards what was claimed as SAA T-90 tank but looks more like a T-62, this means that aside from Jaysh al-Izzah Free Idlib Army also doesn’t know how to differentiate tanks. Out of those two missile launched at this supposed T-62 one damaged it while other missed the tank. One more TOW missile launch was reported on Khattab front where Jaysh al-Izzah destroyed another T-72 tank. 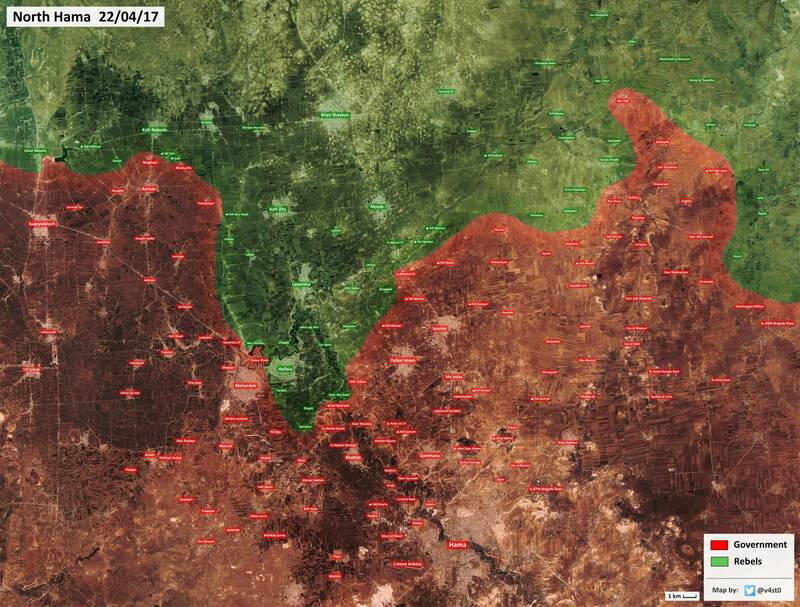 It is obvious that today’s ATGM launches saved rebels in northern Hama by hugely undermining and decimating attacking SAA forces, but in the long run rebels can’t continue defending at this pace with ATGM launches against attacking SAA forces as their missile stock drastically decreases and SAA has both armour and men to spare in these attacks. SAA reportedly advanced in Qaboun capturing several buildings in the district and a rebel headquarters, footage released by pro-government sources showed three captured rebels. Former commander of Liwa al-Habib Muhammad, part of Free Syrian Army’s Southern Front known by his nom de guerre Abu Nuqta was assassinated by unknown gunmen in front of his house in Tafas. Prime suspect is Hayaat Tahrir al-Sham since they’ve used the same tactics against their political enemies in the past. This is not the first time fighters of Liwa al-Habib Muhammad have been targeted in the same way. In February of 2016 the group arrested a person that tried to assassinate one of its commanders in Tafas, individual was paid 200,000 Syrian pounds and was expected to take out at least three other figures. Source of this “crusade” against Liwa al-Habib Muhammad can be traced to March of 2016 when a number of fighters with commanders were arrested by other rebel factions and handed over to Sharia court over alleged collusion with Syrian Government. 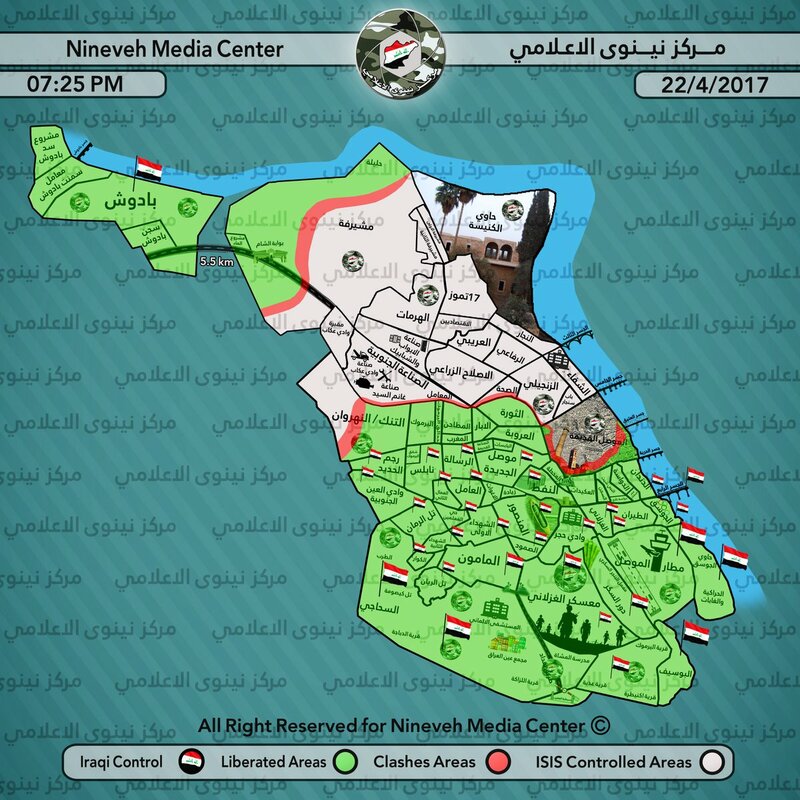 Iraqi Army started an attack on IS-held Al-Saha district in west Mosul with reports that they were able to secure a foothold in southern part of the district which will allow them to mount another attack in Al-Saha aimed at full liberation of district. One of the four IS snipers that have been besieging civilian families in west Mosul has been killed in an airstrike on his position in Al-Rifai district, this action allowed eight families to flee to safety. Remaining three IS snipers are still besieging over 60 families with their fire, they are believed to be somewhere in Al-Rifai district. 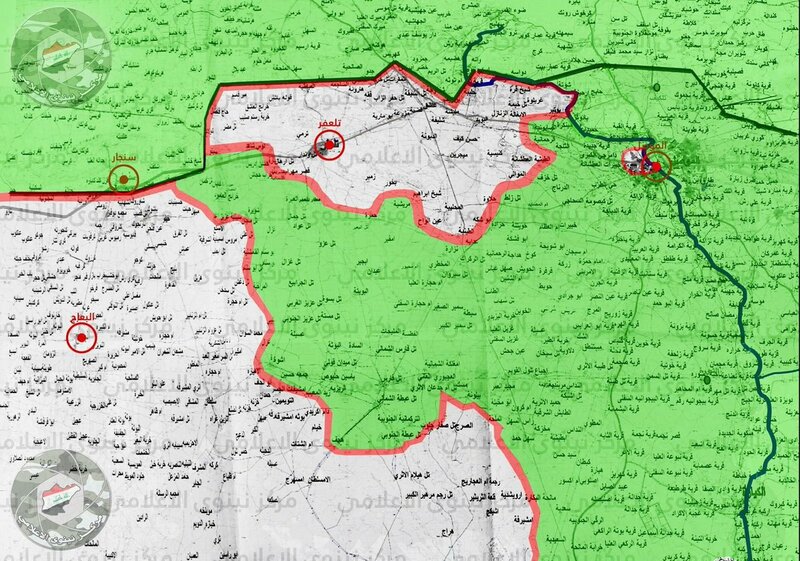 Iraqi forces launched a large counterinsurgency operation in northeastern Diyala governorate, intelligence information recently received showed significant IS presence manifested in sleeper cells and training camps. Al-Hashd al-Shaabi (Popular Mobilization Units) reported that Hassan Younis Shikhtar one of Abu Bakr al-Baghdadi’s cousins was killed in Tal Afar after an IS headquarters were targeted in the city. Another death of a prominent IS figure occurred on 20th of April again at the hands of Al-Hashd al-Shaabi, Abdulrahman sl-Shami well known IS commander of Dabiq special forces was killed in west Mosul. Iraqi forces foiled another IS suicide bombing in Baghdad, that is the third attempt in 24 hours by IS to attack civilians in Baghdad. In Karrada district an IS suicide bomber was arrested while he tried to detonate himself among the civilians. Karrada district has a majority Shia population with a significant Christian minority so no wonders IS tried to create havoc in it with a suicide bombing. On the 21st of April 2017 CJTF-OIR has conducted 21 strikes in Syria. CJTF-OIR‘s main focus in Syria at the moment is Tabqa-Raqqa-Deir al-Zour region where they did 16 strikes supporting SDF‘s operation against IS destroying two bunkers, an IS wellhead, a front-end loader, eight fighting positions, a command-and-control node and an IS staging area. Other area where five strikes occurred is Abu Kamal destroying seven IS wellheads, five oil tankers and five oil processing equipment items. Full report on CJTF-OIR strikes conducted in both Syria & Iraq can be found here.